Home » Free » No Expiration Date » Ned, Fred, Bread and Steve! http://www.line-stickers.com/ – Ned, Fred, Bread and Steve! 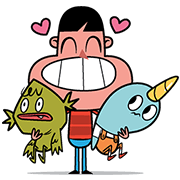 Line Sticker | Ned is a narwhal, Fred is a swamp creature, Bread is bread, and Steve is the boy that brings everyone together. Theyʹre four best friends looking to party! Name LINE Sticker: Ned, Fred, Bread and Steve! Publisher : Christopher Lee / The Beast Is Back Inc. Copyright : © 2013 The Beast Is Back Inc.